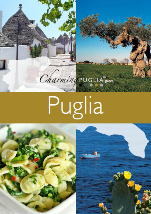 Travel Guide to Puglia | Download the Travel Guide for free! CharmingPuglia.com introduces you the best corners of Puglia, land of sunshine and sea, filled with the memories of the peoples who lived, traded and left their mark here. The Travel Guide to Puglia is available for free! Discover the ‘heel’ of the Boot and get ready to be surprised!